In 2005 I was Artist in Residence with Young At Art. My core project was called Open Your Earlids. 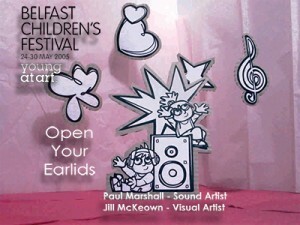 project involved working with 5 schools, 2 in Belfast and others in Armagh, Bangor and Newcastle. Along with Photographer Jill McKeown, our aim was to capture a sonic and photographic postcard of their average school day. The children were also given a number of disposable film cameras. The pieces were exhibited as on screen installations at OMAC for the duration of the festival. Audio was available through Headphones.